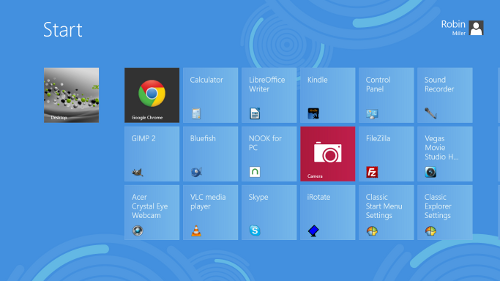 Windows 8 has a groovy “Metro-ish” interface with giant buttons on your screen, great for a tablet computer or a smarty-pants cellular phone. Win8 is also speedier than Windows 7, which is faster than Windows XP, so a Windows 8 upgrade is absolutely worthwhile from a performance standpoint. But using Windows 8 with a keyboard and mouse instead of a touchscreen? Strictly from hunger! It’s a good thing there are ways to make Windows 8 act like the same darling Windows you’ve grown to love (or at least tolerate) over the years. Even better, the most essential Windows 8 add-on utilities and productivity applications are Free and Open Source, and they’re also free of charge. So get ready to make Windows 8 — a great update bargain for $39.99 or less — your new favorite version of Windows. When I said “$39.99 or less,” that’s because you can buy a computer running Windows 7 any time between now and January 31, 2013, and get your Windows 8 upgrade for only $14.99. In fact, any Windows 7 PC you bought on or after June 2, 2012, qualifies for the $14.99 price. And then you install your shiny new Windows 8 and see a screen that looks like it belongs on an iPhone, not on a computer. 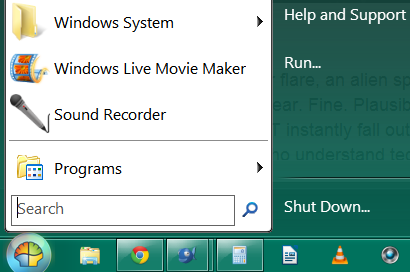 “Say what?” is a common first reaction to the Windows 8 GUI. Many years ago I was standing in the software section of a Staples office supply store and I realized that about half the software they sold was designed to overcome Windows defects. So the idea of fixing Microsoft’s mistakes with add-ons isn’t new. And in this case, my favorite fix (there are others) to the Windows 8 GUI problem is Classic Shell, which is freely distributable (and free to use) under the terms of the MIT License. YAY! A PROPER WINDOWS DESKTOP! 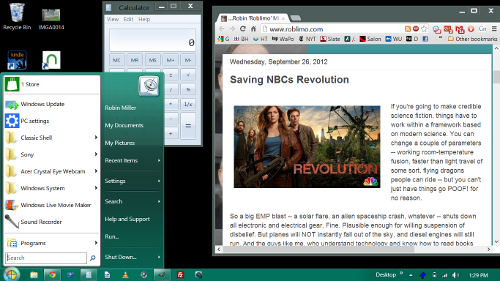 If, for example, you like the basic, same-as-always Windows desktop look, but you don’t want a Start button, no problem. Get rid of it. You can still put your cursor in the lower right corner of the screen and get the official Microsoft Windows 8 program buttons scattered across your desktop or click where your Start button would be if you had one, and bring up a useful start (and stop and administer) menu. You can also use Classic Shell on computers running Vista, Windows 7, Windows Server 2008 and Windows Server 2008 R2 so that they look and behave in similar ways to each other. Except: $40 times five computers is $200, and a lot of out-of-work or fixed-income Americans need to avoid spending $200 — or even $40 to upgrade one PC — right now unless it’s absolutely necessary. So why should I upgrade to Windows 8? Maybe you shouldn’t. If you have a computer that’s doing its job, whatever OS it has on it now is fine. Library-based computer mentor Phil Shapiro told me how, not long ago, he gave an old PC running Windows 95 to a first-grade girl, and how she loved it. It was everything she needed for her homework, even if it wasn’t up to snuff for video editing or navigating a space ship from the Earth to Mars and back again. I was immediately disappointed with the Windows 8 GUI. I am far from alone in holding this opinion of Microsoft’s latest. For someone who’s run Linux and Windows for a decade or two, that Win8 desktop is frustrating. It’s a good thing a friend told me about Classic Shell. It’s friendly, flexible, and free — and makes Windows 8 into a totally usable OS for computers that take their orders from keyboards and mice instead of from touchscreens. Start8 works fine and does many of the same things Classic Shell does. Some people may like it better than Classic Shell. But it’s not FOSS, and Classic Shell is, and that tips my scales toward Classic Shell. Before I got around to testing this trick, I found Classic Shell and decided not to bother trying any more alternatives. So I tried Classic Shell. And I liked it. Not as much as kissing a girl, but enough that I didn’t go any further. So here I am with my little mini-laptop running Windows 8 with a custom menu that’s both familiar to me and set just the way I like it — with another partition on my mini-laptop running Linux, which I’ll talk about in a future post. With a Windows 8 upgrade that cost less than $40, plus a free program to overcome Microsoft’s poor GUI decision, we have a laptop that feels like a new and noticeably faster computer. And that’s a pretty good deal! START BUTTON AND TOOLBAR. BE STILL, MY HEART. When you banish Metro with Classic Shell, Win8 kicks win7's pasty Aero Rump. The only thing that I've had to use Metro for is changing my user picture.